A new species of parrot-sized dinosaur, the first discovered with only one finger, has been unearthed in Inner Mongolia, China. Scientists named the new dinosaur Linhenykus monodactylus, after the nearby city of Linhe. The work is published online today in Proceedings of the National Academy of Sciences (PNAS). The new dinosaur belongs to the Alvarezsauroidea, a branch of the carnivorous dinosaur group Theropoda. 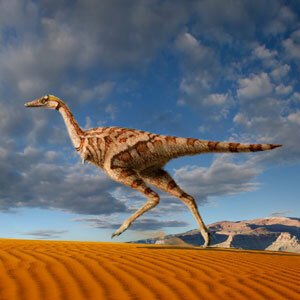 Theropods gave rise to modern birds and include such famous dinosaurs as Tyrannosaurus and Velociraptor. An international team of palaeontologists, led by Prof. Xing Xu of the Chinese Academy of Sciences, found the fossil preserved in rocks of the Upper Cretaceous Wulansuhai Formation, which is located near the border between Mongolia and China. The formation dates to 84-75 million years ago and has yielded a rich trove of vertebrate fossils including the recently discovered theropod Linheraptor exquisitus. The authors uncovered a partial skeleton from the site, which included bones of the vertebral column, the forelimb, a partial pelvis and nearly complete hind limbs. Linhenykus most likely grew to a couple of feet tall and weighed only as much as a large parrot. The new theropod is unusual in having just one large claw, which may have been used to dig into insect nests, on each of its hands. This feature makes the specimen the only known dinosaur with one finger, and highlights the wide variety of evolutionary modifications of the hand that existed in different theropods. Michael Pittman of the Department of Earth Sciences at University College London, co-author and discoverer of the specimen said: "Non-avian theropods start with five fingers but evolved to have only three fingers in later forms. Tyrannosaurs were unusual in having just two fingers but the one-fingered Linhenykus shows how extensive and complex theropod hand modifications really were." Jonah Choiniere, co-author and co-discoverer of the specimen from the Division of Paleontology at the American Museum of Natural History said: "Vestigial structures, like legs in whales and snakes, may appear and disappear seemingly randomly in the course of evolution. Linhenykus highlights the vestigiality of the outer fingers of advanced alvarezsauroids and underscores the complexity in evolution of these vestigial fingers." Linhenykus lived with closely-related and similarly-sized theropod dinosaurs, but the specializations of its skeleton may reflect differences in behaviour or foraging strategy. Linhenykus also lived alongside small mammals, lizards, clubbed dinosaurs (ankylosaurs) and horned dinosaurs (ceratopsians). Research undertaken at UCL Earth Sciences spans a diverse range of activities including crustal processes, Earth and planetary evolution, mineral physics, palaeobiology and palaeoclimatology, polar observation and modelling, natural hazards, environmental geochemistry and sedimentology. The department's teaching, reflecting the diversity of its research, encompasses a wide range of undergraduate and taught graduate programmes together with an active body of graduate research students.